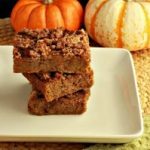 Magical Paleo Pumpkin Crumble Bars are a great fall treat. Creamy pumpkin cake layer with a coffee cake crumble topping. Will magically disappear from your kitchen! 2 tsp pumpkin pie spice. 1/4 cup unsweetened almond milk or coconut milk. 2 tbsp coconut oil or dairy butter melted. 1 tsp gluten free organic vanilla extract. 1/2 cup almond or pecan meal (grind up raw almonds or pecans in a magic bullet or coffee grinder until course grained meal forms) or can purchase at Trader Joes. 3 tbsp unsweetened organic coconut flakes. 2 tbsp coconut sugar for paleo or for low carb use a low carb granulated sweetener (I used 2 tbsp eyrithritol). 3 tbsp coconut oil or dairy butter melted. Preheat oven at 350 F, and grease or oil an 8x8 pan. In a large mixing bowl combine: 1/3 cup sifted coconut flour, 2 tsp pumpkin pie spice, 1 tsp cinnamon, and 1/8 tsp sea salt. Mix together thoroughly. Set aside. In a different large mixing bowl combine: 2 eggs, 1/4 cup almond or coconut milk, 1/3 cup pumpkin puree, 2 tbsp melted coconut oil or butter, 1/3 cup maple syrup or sweetener of choice, and 1 tsp vanilla extract. Mix together until combined. Add the baking soda –vinegar mixture to the egg mixture. Mix together thoroughly. Pour and spread batter into greased 8x8 pan, and set aside. In a medium mixing bowl combine all the crumble topping ingredients, use a fork to mix topping until a paste forms. Take the crumble topping and scatter chunks of crumble topping all over the top of the pumpkin batter in the pan, *seen in photo above*. Bake at 350 F for 28 to 30 minutes or until top is browned, and toothpick comes out of center clean. Cut into 9 medium size bars and serve. [Nutritional Data For Paleo Version: Serving: 1 medium size bar out of 9, Cal:163, Fat: 9.8 g, Carbs: 12 g/ Net Carbs: 9.4 g, Fiber: 2.6 g, Protein: 3 g, Sugar: 8 g.